The Adaptive Web is a new research area addressing the personalization of the Web experience for each user. 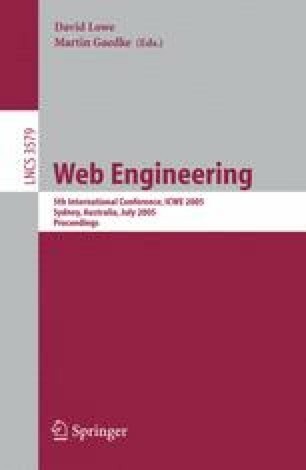 In this paper we propose a new high-level model for the specification of Web applications that take into account the manner users interact with the application for supplying appropriate contents or gathering profile data. We therefore consider entire processes (rather than single properties) as smallest information units, allowing for automatic restructuring of application components. For this purpose, a high-level Event-Condition-Action (ECA) paradigm is proposed, which enables capturing arbitrary (and timed) clicking behaviors. Also, a possible architecture as well as a first prototype implementation are discussed.